One of the most common issues with the 1989 through 1997 Ford Thunderbird and Mercury Cougar cars is the doors sag over time. The doors are long and they're heavy so over time, the bushings and pins get worn out and cause the doors to drop or sag down when opened. That makes closing more difficult and can damage the car body where the doors meet. In extreme cases, the door won't even stay closed. A quick search on the 'net turns up owners of Mustangs, Crown Vics, Explorers, Rangers, and other vehicles who also have the same issue, although probably to a lesser degree considering the difference in door lengths. I have a 1996 Thunderbird and it's doors drop down (sag) when I open them. Both of them. I knew the sag was pretty much "normal" for these cars so hadn't given the issue all that much thought until recently. I found out you can fix the sag fairly easily by replacing just the hinge pins & bushings without removing the whole door and looked more into the issue. So I decided I'll fix it myself, and document the whole procedure to hopefully help out some other owners. I know from the receipts given to me by the original owner of my Thunderbird that the drivers' door hinge pins, bushings, and striker were replaced back in 2004 by the Ford dealer body shop, at a cost of $147. I'm sure in today's dollars, you'd be looking at closer to $200 per door, to have a body shop fix it (retail price). I'm not going to pay $300-400 to get my doors fixed considering I might be able to do it myself for a lot less. If your doors are sagging, you really have two options if you are going to fix it yourself. 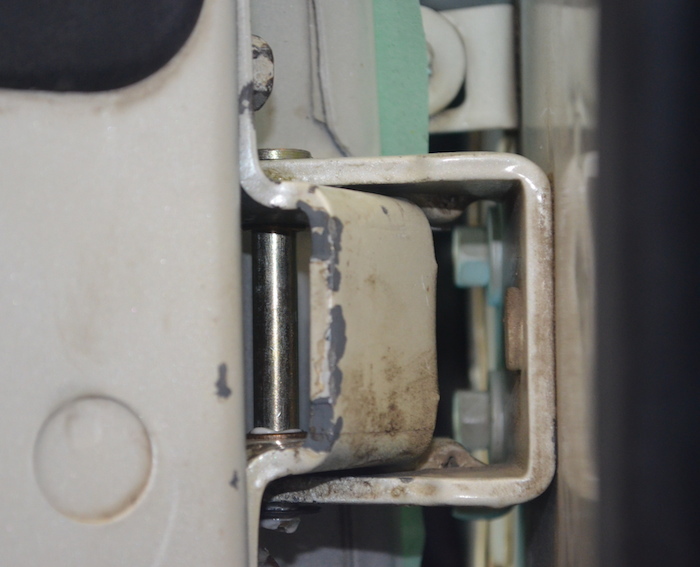 You can either replace the hinges with new ones, or you can repair them by replacing the hinge pins & bushings. New hinges can be bought from Ford, although they are likely going to be obsolete in the near future, like many other parts for the 1989-1997 T-Birds & Cougars. I see some for sale on eBay and Ford dealer parts sites, the hinges sell for about $63 for the upper hinge which is Ford part number F4SZ-6322800-B, and the lower hinge goes for about $85 and is Ford part number F7SZ-6322810-AA from what I can tell on online sources. The upper hinges are the same for both doors, and the lower hinges are the same for both doors, and obviously the upper and lower hinge are different. 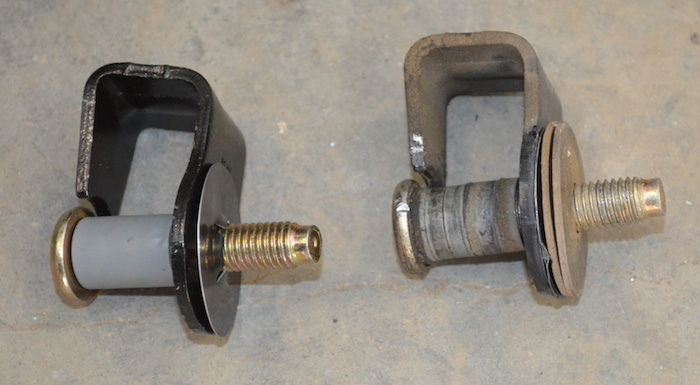 With that said, the hinge pins and bushings are the same between the hinges. Personally, I chose to try repairing / rebuilding the hinges prior to replacing them. Replacing them involves repainting the hinge, accessing the interior of the car's body through the kick panels, or even behind the dash, etc. Replacing the hinges is a lot more involved than replacing the hinge pins & bushings. If you're going to replace the pins & bushings, please do both hinges on the door, don't just replace one, the cost difference is minimal. 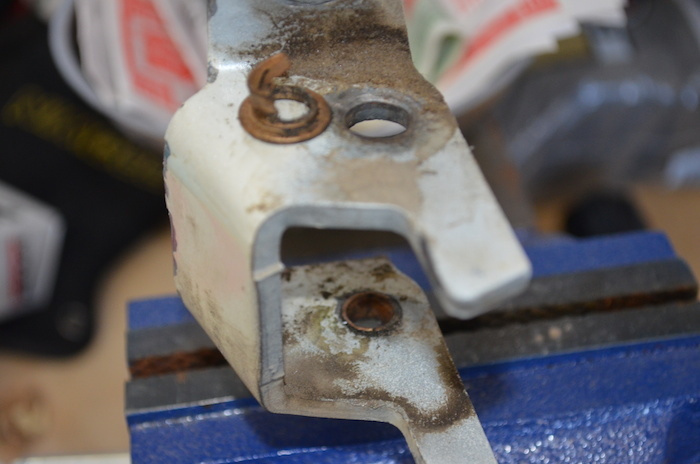 This article will cover the cheaper, more popular hinge pin & bushing replacement option. OK, so let's go over how to fix your door hinges. First off, let's talk parts. It's worth mentioning that the OEM Ford bushings are thinner (and obsolete now anyway), so what you really want to get is the Dorman HELP! hinge pin & bushing kit from your local auto parts store. Optionally you may wish to use an OEM Ford striker bolt instead of the Dorman part, which is Ford part number F3SZ-6322008-A, this is what I chose to use since you know it's top quality. NOTE: It has come to my attention that the Dorman 38445 strikers may only fit 1989-1993 T-Birds / Cougars. It would be interesting if someone with a 94-97 car could verify. If you would rather use Ford bushings and hinge pins, those part numbers are D9ZZ-6643030-AA for the pins and D9OZ-6522841-C for the bushings. Again, I recommend the Dorman kit instead. The Dorman hinge pin & bushing kits that I bought were $9 each at the local auto parts store, and the Ford striker bolts retailed at $39 each at my local dealership. The Dorman striker is in the $15-20 neighborhood. I know a guy at the parts dealership that gave me a good deal so in all, with tax I spent $83 and change on parts to repair both doors. That's a lot less than the estimated $300+ to have a body shop do the work. Note: Before you start you may wish to use masking tape to tape off the rear edge of the fender and front edge of the door to help protect the paint. Alternatively you could put a towel between the door and fender when you open it, or possibly use pipe insulation. I chose to start with the top hinge and I recommend the same, it is the easier one to start with. OK the first step is to open your door fully and get your jack out and jack up the door slightly. The goal here is basically to lift the door enough to take the weight off the hinge pin to make it easier to remove. You're not trying to jack the door so much that it lifts the car, that's too much. Personally I had a rubber saddle for my floor jack, so that's what I used. Optionally you could use a regular floor jack with a towel or piece of wood on it, you could fabricate a wooden stand to hold the door, etc. Be creative LOL but don't ask a buddy to hold the door up, the process will take too long and it will probably end badly. Once you have the door jacked up ever so slightly, mark the hinge where it attaches to the door using a marker or sharp pencil. You will be removing the door side of the hinge and when you put it back you want to put it back in the exact same spot that it was in before. You don't need to mark the body side of the hinge. 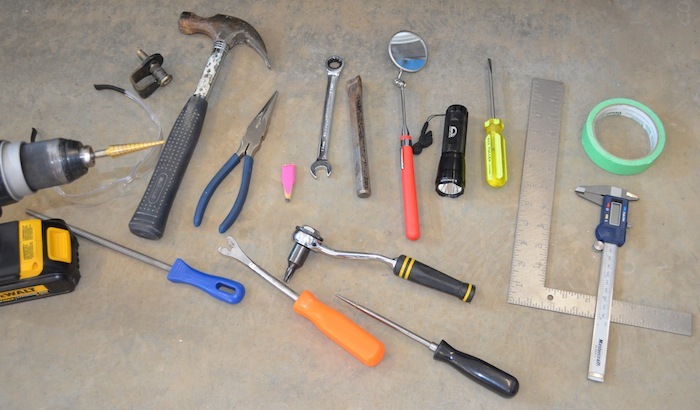 After you've marked the location of the hinge on the door, the next thing is to use a 13mm wrench to loosen but not remove the bolts from the door. Don't touch the bolt holding the hinge onto the car's body. 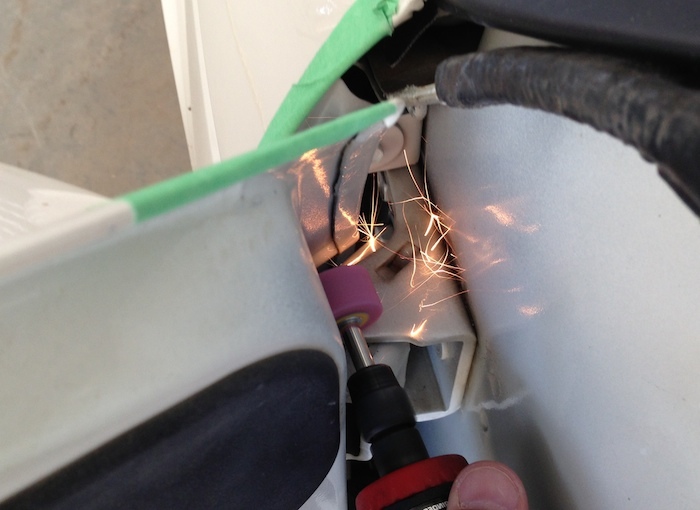 REMEMBER TO LOOSEN THE BOLTS ON JUST THE ONE HINGE YOU'RE WORKING ON, NOT ALL THE BOLTS!! Now that you've loosened the bolts, you should have a little more clearance. Fully remove the top bolt to make room for the next step. The door may move or drop slightly when you do this. Using a dremel with a grinding attachment, grind off the head of the pin. 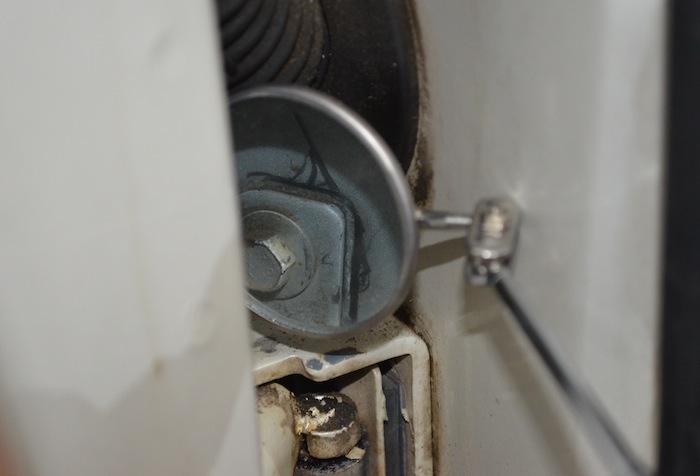 The goal here is to grind that down so it is flush with the main part of the hinge. Remember grinding will heat the metal up so let it cool off before touching it. I've heard of some guys using an air chisel to take the part off too, do so with caution. Realistically you're probably going to wind up removing a bit of paint on the top of the hinge during this process. 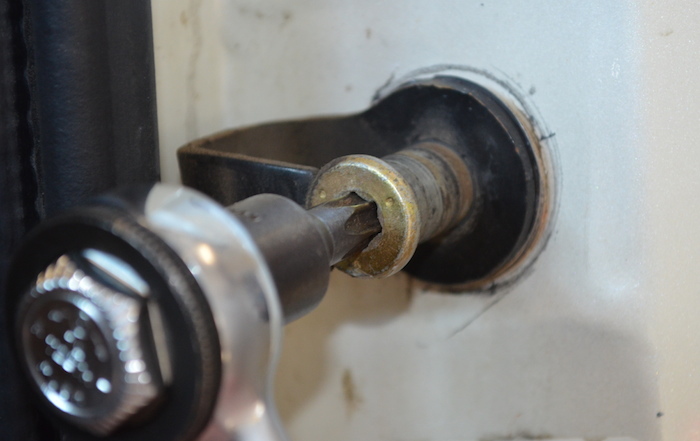 After the top of the pin (head) has been ground off, remove the bottom bolt on the door side of the hinge. Then use a punch and hammer to drive the pin down and out through the bottom of the pin, hit it where you ground the head off. This will now separate the body and door sides of the hinge. ** REMEMBER** The car side of the hinge you do not touch, don't try to loosen or remove it. You do not drill into it or anything, leave it alone. In my case, the hinge pins had been replaced on the drivers' side of the car years ago so I was able to remove the clip on the bottom and punch them up and out. Some guys have also said that they use a cutoff wheel to cut the hinge pin in the middle, toward the bottom and punch it out the top & bottom that way. So after you have the old bushings removed from the hinge half, the next step is to drill the holes larger to fit the new, thicker Dorman bushings. In the case where you are using OEM Ford bushings, you shouldn't need to drill. But I highly recommend the Dorman bushings. They're thicker and will last a lot longer than the Ford ones. Plus pretty much every auto parts store carries them anyway. OK, well the package wasn't all that great at telling me how big to drill the hole to fit the new bushing. However you don't want to drill too big or the bushing will spin instead of staying stationary. And you don't want to undersize the hole because when you force the brass bushing in, it will compress slightly making the pin not fit or fit very tightly. I accidentally drilled the hole too small one time and the bushing got smaller since brass is soft, and the pin would not fit through the hole. Whoops, so I had to remove the bushing, buy a proper drill bit and another pin/bushing kit and re-do it. The lesson here is buy the proper 15/32" drill bit to drill out the existing hole in the hinge to make the Dorman bushing fit well. 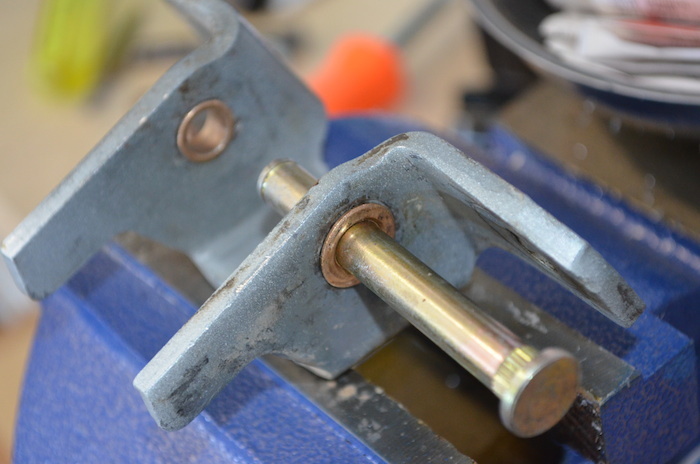 Once you have the two holes drilled (try to drill them straight as possible, use a drill press if you have one), the next step is to tap in the new bushings using a hammer. Try to tap them in straight, then do a test fit of the new Dorman pin, push it through (not all the way) to be sure it will line up well when you put it back on the car. OK so at this point as long as the pin slides in OK you are ready to re-install the hinge half. Remove the pins if they're still in there, next use some white lithium grease or similar grease to lube the bushings that you just installed. Just spread the grease around. So now you are ready to re-install it. Position the hinge half back on the door in the correct position, and install the bolts holding it to the door. Just finger tighten them for now, no need to tighten them all the way down right now. Next, take the new hinge pin, and install it from the top down, you may need to wiggle the door, hinge, or pin while tapping it in gently with a hammer. It should slide down and seat all the way. Install the E-Clip on the bottom of the pin. Now it is time to tighten the bolts holding it to the door. If you did a good job of marking the hinge's old position you should be able to line it up, move it around slightly to do that, and then tighten those bolts down. Don't worry if you're out by a tiny fraction of an inch, it will likely still be OK in terms of alignment. 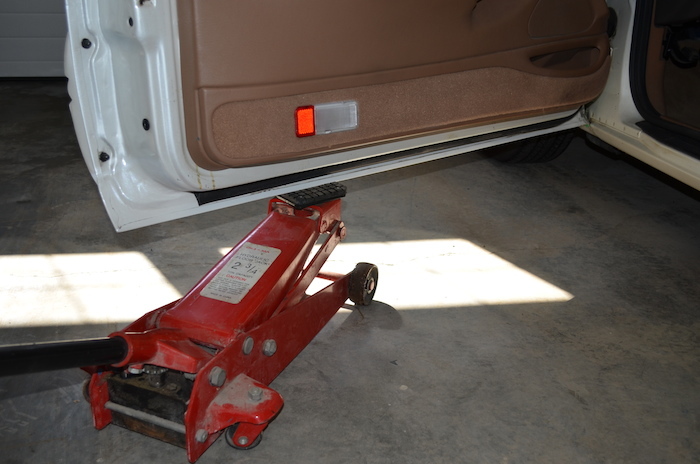 If it's all bolted together and looks good, you can remove the jack from under the door and slowly close the door, watching that front area of the door where it meets the fender. Be sure to watch and make sure there is no binding, make sure the door doesn't hit the fender. If you need to adjust the door in/out to line up with the fender you just loosen those same bolts and move the door slightly in or out. 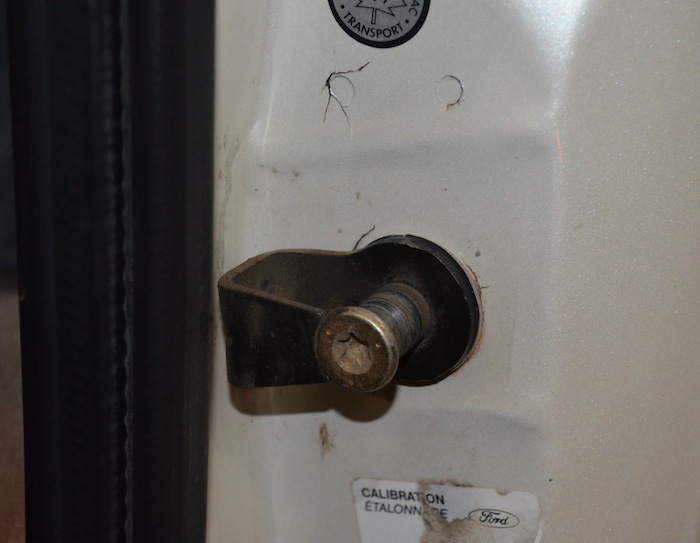 If the door is too far forward or back then you use the bolts on the car (body) side of the hinge to make that adjustment. But since you didn't touch those bolts you really shouldn't have to touch those. Now, repeat the procedure for the other hinge on the door. The lower hinge is the same except it has a roller in it so it's a little more work to physically get the hinge half out. It's do-able and if you do the upper hinge first you will be in a better position to get that bottom one done. When you are done, you may have to adjust or replace the door striker, this is the thing that the door latch latches to. As you can see by the first photo in this article, the door sagging caused the metal stress cracks in the metal around the door striker. It's also common for the plastic sleeve on the striker to break off which also causes minor problems. Again, I chose Ford parts for the strikers because I got a deal, the Dorman ones are probably comparable in quality although I have not used them. The important thing here is to mark where the bolt is before you loosen it. I simply used a pencil to trace around the circle. Once you loosen the bolt, you can adjust the striker up, down, in, and out, so it's important to mark it before you loosen it. So after you've transferred over the shims, install the new striker bolt, wiggle it around to align it correctly prior to tightening it down for the final time. Once you're done, open and close the door a few times to make sure it's closing properly. If you need to adjust that striker up/down/in/out, only make very small adjustments and re-test. I hope this article helps you keep your Thunderbird or Cougar on the road longer, and make it more enjoyable. I know having a door that opens/closes like new really makes me feel like the car is better. Good luck! Here is a video I did after doing the driver side hinges & striker. It closes like NEW!